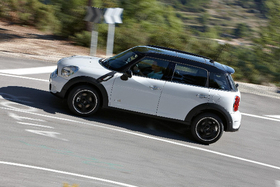 The Countryman goes on sale Sept. 18 in Europe. Prices will start at 20,200 euros. MUNICH (Bloomberg) -- BMW AG's Mini, known for its retro-chic appeal, is targeting an unhip crowd with the Countryman crossover: families. The not-so-mini Mini will have four doors and be the brand's biggest ever model. The new Countryman is part of a revamp of the entire portfolio of the Mini brand, which BMW restarted in 2001 after selling the unprofitable MG Rover Group. The company has sold 1.7 million Minis since then, helping the Munich-based automaker attract customers who may later buy more expensive BMW models. “BMW has been building the Mini brand very successfully in the past 10 years, but it needs to evolve,” said Stefan Bratzel, director of the Center of Automotive at the University of Applied Sciences in Bergisch-Gladbach, Germany. “The Mini brand has always spoken to the trendsetters, the post-materialist crowd. The problem with those guys is they're fairly fidgety and switch products easily and frequently,” he said. The Countryman, which features expanded leg and storage room in the back, will go on sale Sept. 18 in Europe and starts at 20,200 euros ($25,680), Leonhardt said. The face-lifted regular Mini will retail for 15,550 euros. The Countryman may eventually make up 20 percent of Mini sales, he said. The Countryman, named after a Mini station wagon from the early 1960s, will compete with Kia's Soul wagon, Toyota's RAV4 SUV and Nissan's Qashqai, Leonhardt said. German rivals include Volkswagen's Golf and the Yeti SUV from VW's Skoda unit, he added. BMW bought Mini's owner, Rover, in 1994 for 1.2 billion euros and ended up losing 6 billion euros on the unit in the next six years as its market share shrunk. The results sparked the ouster of then-CEO Bernd Pischetsrieder. BMW kept the rights to Mini when it sold Rover in 2000 and revived the 51-year-old nameplate a year later to tap the small car market. The Countryman's introduction coincides with a revamping of the entire Mini range. Face-lifted versions of the standard Mini, the larger Clubman and the convertible will all be rolled out to European dealers the same day as the Countryman. First-half Mini sales gained 7.6 percent to 109,301 vehicles. 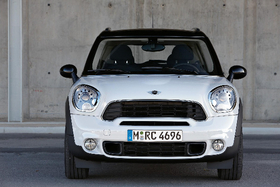 The Countryman replaces the brand's round headlights with larger drawn-back ones, and has a bigger radiator grille. The U.S. market, Mini's biggest in 2009 with sales of 45,000 cars, will get the Countryman early in 2011, Leonhardt said. China, where Mini sold 4,000 cars in 2009, will be the most significant growth market for the brand in the coming years, he added.The Countryman replaces the brand's typical round headlights with larger drawn-back ones, and features a bigger radiator grille. The trunk offers 35 percent more room than the Clubman, and the back seats flip forward for more storage, enough to hold two mountain bikes with their wheels off. An aluminum rail in the middle, which runs all the way from the gear shift through the back row, offers configurable storage slots for cups, glasses and Apple Inc. iPods, which can be linked directly to the car's computer. Buyers can also choose a third back seat instead, and upgrade to four-wheel drive on the high-end versions, Leonhardt said.